In the 1880 census Louise’s immigration year is listed as 1880 while her obituary states 1879. She lived in Northfield, Rice County, MN from her arrival until her marriage in 1882. Immigrants often got money for their tickets by agreeing to work off their trip once they arrived. Possibly Louise was working off her trip in Northfield for the three years between the time she arrived and the time she married. Their marriage certificate states that Louise and William were married on March 3, 1882 in the private Ramsey county home of witnesses Regina and Carl Zimmerman. William was living in Big Stone county in western Minnesota and Louise had been living in Rice county in south eastern Minnesota. Researching how William and Louise might have met has been a fun challenge. Witnesses Carl and Regina Zimmerman might have been in-laws of Louise’s sister Ernestine Zimmerman. Two years earlier per the US Census, Regina and Carl Zimmerman had been living in Rice County. Ernestine and Louis lived in the Johnson, area but had come from Northfied (per the Trinity Church 1882-1982 history). It might be that Louise and William met when one family visited the other. The Weisses and Zimmermans may have known one another back in Baden Germany. The Weisses were from Blankenloch, the Zimmermans were from the town of Graben, just a few miles away. 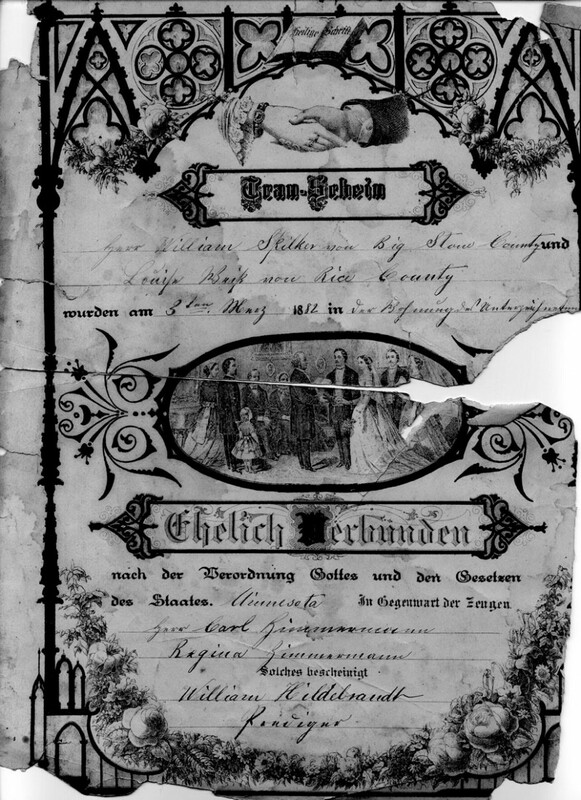 “Louise Spilker, nee Weiss, was born that she was born in Blankenloch, Baden, Germany on the 25th of December 1858. Baptized in her infancy, she was later instructed in the Christian faith and at the age of 14 became a member of the Lutheran Church through confirmation. In 1879 at the age of 27, she came to America and spent 3 years at Northfield, Minn. On the 2nd of March 1882 she was united in Marriage to Wm. SPilker. He died 36 years ago leaving her with 5 children, all of whom survive. To them the mother with her quiet and loving disposition, her christian fortitude and simple faith must always remain an example worthy for them to follow. These children are Anna, Mrs. Detlof Behrens with whom she made her home; Louise, Mrs. John Nornberg, both of this vicinity; Lydia, Mrs. Emil Mowdrow; Fred and August, these three from Clarissa, Minn.. In Mrs Spilker, our congregation has lost the last, local, surviving member of the founders of Trinity church 51 years ago. 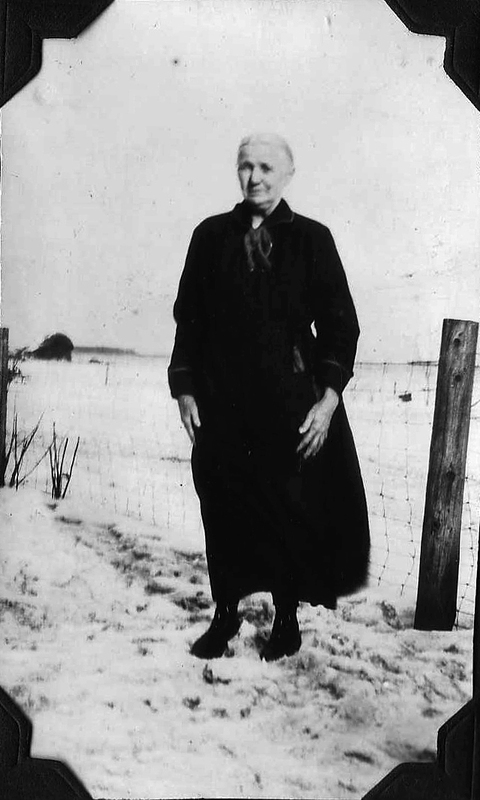 Caro’s (Caroline’s) Grandma Spilker had a sister that lived in the Johnson, MN area. Caro knew her as Tante Zimmerman. She was dark complected and heavy set. Grandma Spilker was light complected and slight. All of Grandma Spilker’s kids were dark complected. Caro thinks she remembers the hearse with Tante’s body drive by her parent’s farm near Johnson, MN when she was a girl. Grandma Spilker was too sick to attend the funeral.